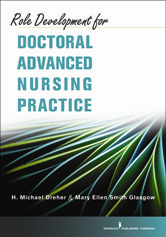 Functioning as both a graduate and professional textbook, Role Development for Doctoral Advanced Nursing Practice explores the historical and evolving role of the new doctoral advanced practice registered nurse.This innovative text presents a distinctive two-part chapter organization that provides content followed by one or more Reflective Responses, which consist of commentaries that may counter or support the opinions of each chapter author. Written by well-known DNP leaders representing the diverse roles and experience of academics, administrators, and practitioners from different DNP programs, these Reflective Responses initiate thought-provoking classroom discussion. This stimulating and provocative text presents issues germane to DNP education, core competencies, and unfolding role development. It is an essential resource in DNP role development courses and courses covering contemporary DNP degree issues.